You don't need to sell Chad Pipkens on the importance of a reliable outboard. The second year Bassmasters Elite Series pro from Holt, MI qualified for the 2015 Bassmasters Classic by winning the Sept 4 - 6, 2014 Bassmasters Northern Open on Lake Erie when motor problems delayed the tournament leader on the final day. Pipkens is sponsored by Yamaha and powers his Skeeter FX20 with a Yamaha 250 V MAX SHO. But like Matthew McConaughey and Lincolns, Pipkens was driving a Yamaha before they paid him to drive one. "In a tournament, when you're making long runs you don't have any margin for error and you really need to be able to count on your motor. I know when I turn the key my motor is going to start and it's going to get me back on time." 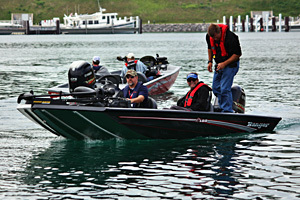 At a recent media event on the shores of Little Traverse Bay, members of the media were invited to test drive some of Yamaha's popular V MAX SHO outboards on bass and walleye boats. 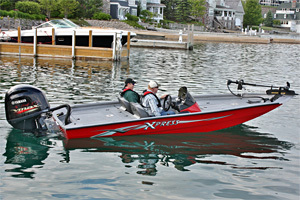 Although Skeeter didn't bring along an FX20 like Pipkens,' Ranger and Xpress both brought aluminum bass hulls. Xpress showed a soon-to-be-released 19 foot high-performance aluminum hull paired with a 175 V MAX SHO. The combination performed exceptionally well, hitting a top speed of 65 mph and smoothly handling the light chop of Little Traverse Bay. Ranger's RT188 aluminum hull bass boat powered by a 115 V MAX SHO also performed well although the 60 horsepower concession in horsepower resulted in lower top end performance compared to the Xpress. 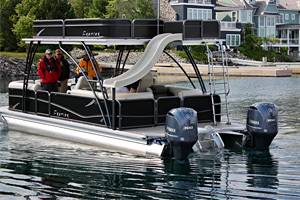 Another boat that might catch the eye of bass anglers was a 27 foot Sunstation Walk-on pontoon boat from Premier. Why would a bass angler care about a pontoon boat you ask? Well, most bass anglers care about performance and this is one pontoon boat that performs thanks to twin 300 hp Yamaha F300XCA engines mounted on the outside pontoons. The combined 600 hp output propelled this two-story behemoth to a respectable 55 mph. The twin engines, controlled by Yamaha's Helm Master integrated digital control system at idle speeds, made maneuvering the craft in tight spots simple, even in cross winds and current. In addition to the two bass boats, new 25 inch shaft versions of Yamaha V MAX SHO's were on hand to power walleye boats from Skeeter and Alumacraft. These long shaft versions of the V MAX SHO motors draw their heritage from the popular 20 inch shaft versions developed with bass anglers in mind. The V MAX SHO outboards showcased in Bay Harbor – like all Yamaha outboards since 2013 – were four-stroke engines. Thanks to technological innovations like variable valve timing and lightweight cylinder linings manufactured with a unique plasma fusion process, Yamaha is able to achieve weight and performance numbers that meet or exceed that of comparable two stroke engines. Combined with the better fuel economy and emissions inherent in four-stroke engines, the 2013 cutover to an all four-stroke lineup made perfect sense. Yamaha also reiterated their commitment to providing an overall outstanding ownership experience by making it easier for anglers' to care for their outboards. Their "Maintenance MattersTM" campaign provides simple instructions on when and how to care for outboards as well as helpful tips such as how to use a penny to keep battery terminals from corroding. Making maintenance easier makes sense for weekend anglers as well as tournament pros like Pipkens whose livelihood depends upon his motor's dependability.